Light. Directly from the socket. Simply dock the Plug & Light light attachment to the light socket on walls or ceilings and illuminate the room with the desired lighting situation. Plug & Light functions that simply. Lighting control sourced directly from the socket. The core of the system is the Plug & Light light socket, which can be installed in all standard European appliance sockets. 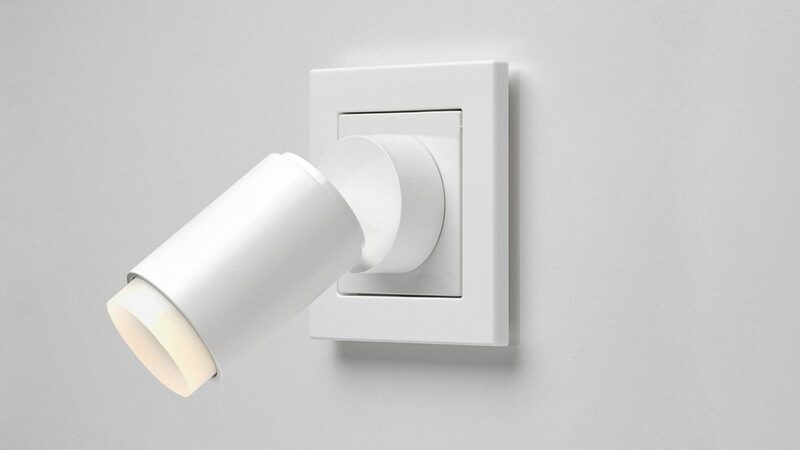 The mobile LED light attachment is docked to the light socket by a magnet – immediately ready for operation and dimmable. The user can attach and replace other luminaires at will – no further installation necessary. Interior lighting becomes adjustable, atmospheric light incredibly easy. Insta developed the system. Tobias Link is responsible for the design of the concept. Gira and Jung are already implementing it in their switch series. Brumberg was the first of our partners to develop five compatible Plug & Light luminaire series. Together they pave the way to a new world of lighting design.